Facebook has now topped 1 billion users, but the past few months have not been easy. Facebook has now surpassed 1 billion users, despite having a turbulent past few months. CEO Mark Zuckerberg announced Thursday that the social networking site has more than 1 billion active users each month. In a status update on his Facebook page, Zuckerberg wrote, "Helping a billion people connect is amazing, humbling and by far the thing I am most proud of in my life." There are more than 18 million Facebook users in Canada, according to the marketing website Socialbakers. Zuckerberg also posted the company's first video advertisement called "The Things That Connect Us." The milestone comes at a difficult time for the company. Zuckerberg said Thursday that it is going through a "rough cycle" following its rocky initial public offering in May. There were trading glitches the day it went public and concerns about its revenue potential. The company is also facing lawsuits from disgruntled shareholders. "We're in a tough cycle now and that doesn't help morale, but people are focused on what they're building," Zuckerberg said in an NBC interview. Vincent Mosco, a sociology professor at Queen's University, says that while topping the 1-billion-user mark is a major accomplishment, Facebook still faces a bumpy road ahead. Unlike other tech companies such as Google, Apple and Microsoft, which sell hardware, software or services, "all that Facebook has to offer is virtual space for people to gather," said Mosco. "It doesn't have anything more than information about its customers to sell," he said. "You have this great irony that it’s a service that has a billion customers, but it has not been able to make a significant inroad into the marketplace occupied by some of the bigger players." This business model of selling users' information has led to a number of privacy concerns over the years. In 2009 Canada's privacy commissioner determined that Facebook was breaching the country's privacy law by sharing users' personal information with games developers. 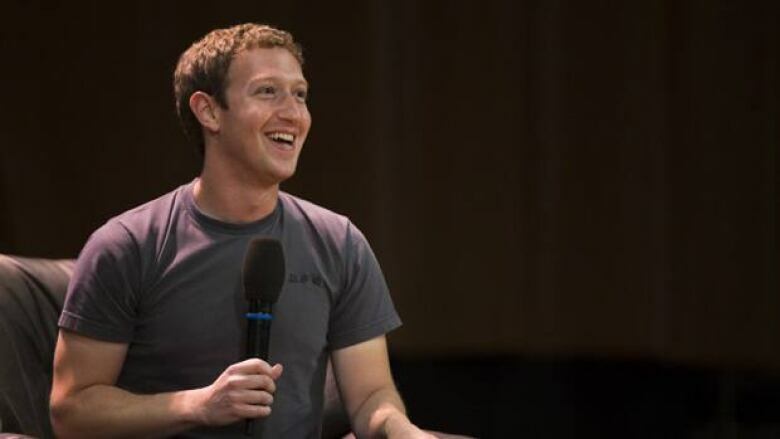 The 28-year-old Zuckerberg continued to reassure people Thursday that he is the right person to lead Facebook. Some on Wall Street have questioned whether he has the ability to lead a large public company. "I take this responsibility very seriously," he said. Facebook Inc.'s stock gained 45 cents, or 2.1 per cent, to $22.28 in premarket trading Thursday. The shares closed at $21.83 on Wednesday, off 43 per cent from its $38 IPO price. Following criticism that the company hasn't capitalized on mobile quickly enough, Zuckerberg said that Facebook's future is about mobile. Mosco, however, is skeptical that the company will find financial success with this route, pointing out that it's tough to convince advertisers to buy ad space on such tiny screens. As Facebook struggles to find a way to monetize its success with users, Mosco says that it could consider developing software or an operating system, or even charging fees to the site's heaviest users. "When I heard the news about a billion people this morning, my first thought was, 'Well what if you charge a dollar each per year?,'" Mosco quipped. Another option for the company, he said, would be to set its sights a little lower. "Facebook may decide it's not a company that wants to compete with the big boys and simply settle into a comfortable situation where it makes a decent return on investment and provides a service to people around the world with a valuable brand."